This book is about the relationship between citizens and the state. Their relationship has tended to be argued from a top down perspective without systematically examining empirical data about their association. 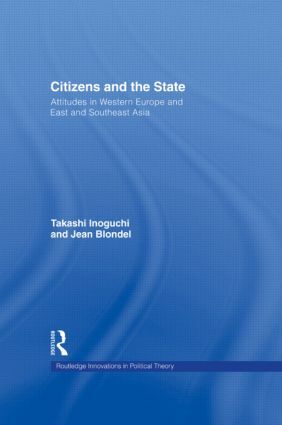 In contrast, Citizens and the State, analyses the relationship from a primarily bottom up standpoint. Using the 18 country cross-national survey (the Asia-Europe Survey) data it examines how citizens relate themselves to the state. how strongly do citizens identify themselves to the country? how much confidence do citizens place in the state and its institutions? how satisfied are citizens with life and politics? Innovatively, the book attempts to answer these questions by first setting up six types of relationship between citizens and the state via factor analysis of the survey data pertaining identity, confidence and satisfaction then by examining country profiles more closely and beyond the six types. The book will be of interest to students and researcher of political science, political theory, comparative political science, Asian Studies, European Studies and sociology.